"After 20 years of winemaking in the Napa Valley, John Kongsgaard launched his own brand of Chardonnay with the 1996 vintage. As former winemaker for Newton Vineyards, John had already become well known for creating California's first unfiltered Chardonnay. 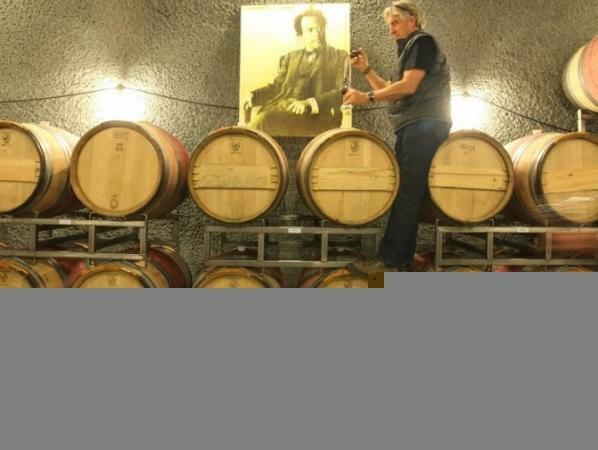 Since then, he and his wife Maggy have added Syrah and a Viognier-Roussanne blend to their portfolio of wines. The core of their endeavor is the ten acre vineyard planted on a rocky hilltop in southeast Napa Valley which has belonged to the Kongsgaard family since the 1920's. For 50 years the volcanic slopes sustained a small herd of skinny cattle and provided the idyllic romping grounds for two generations of lucky kids including John. In the 70's John and Maggy planted eight acres to Chardonnay, adding an acre of Roussanne and Viognier in 1995 and the final acre of Cabernet Sauvignon in 2001 (which had its first crop in 2004). The extremely rocky soil has the vines on a near-starvation diet, restricting yields to one to two tons per acre of super-concentrated fruit. In addition to these family acres, the Kongsgaards direct the farming under long-term contract on another seven extraordinary acres of land in the Carneros which provide them with Syrah and a few additional tons of Chardonnay important for balancing the high intensity family grapes. Their low-intervention winemaking is modeled after 19th Century traditional European cellar practices (imagine the world before Pasteur and electricity). They avoid adding yeast and bacteria to the wine, and do long elevages in oak with little or no added SO2. At bottling, fining and filtration are avoided in their quest to express the essence of their unique vineyard sites. While the Kongsgaard wines can be enjoyed for their sheer power and intensity when young, they develop beautifully with several years of bottle age. All of the Chardonnays, even the initlial 1996 are still drinking beautifully and improving, with no signs of cracking up. In October, 2004, John was named "Winemaker of the Year" by Food & Wine Magazine in the annual Wine Issue. "What are Kongsgaard's next big plans? 'Absolutely none,' he says. After two decades in larger production wineries, he is thrilled to make a very modest total of 4000 cases all by himself: 'I like going down in the cellar, putting on a Mahler symphony and working with my wine. That's what makes me happy.'"